The rich get richer and income inequality in America continues to grow in 2013. The wage situation improved from 2012, but it's still pretty bad. The median wage was $28,031.02 in 2013 a paltry 1.9% increase from 2012. While the ratio of median wage to average wage improved, the 110 super rich are now earning 2595 times more than average workers. The rich get richer and income inequality in America continues with no end in sight. The latest evidence is from the social security administration The gap between rich and the rest of us continues to grow. Every once in a while we see a piece of data which makes the hair on our heads stand on end. Such is the Census Foreign Trade graph of the month. Below are corn exports and their percent change a year from June 2012. 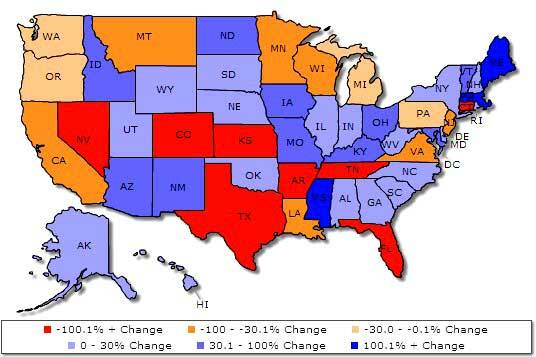 The more orange a state is, the more their exports declined. Texas corn exports declined a whopping -272.6%, Kansas dropped -160.9%. Arkansas is a real disaster, with a -445.2% drop in corn exports as of June 2012. What's worse is the June data only gives a 10% national drop in corn exports from a year ago. July gave much worse figures. By July 2012, the United States corn export decline was the lowest in 19 years and had dropped 40% from a year ago according to the latest USDA statistics. The U.S. is the largest exporter of corn and corn is the largest export of course-grains. The below charts are from the USDA grain report. Read more about Corn Ripples! The Central Banks went on the move. Within 45 minutes of each other, the ECB lowered interest rates, the Chinese central bank did too and the U.K. just enacted more glorified quantitative easing. BoE increased their asset purchases by £50 billion to a grand total of £350 billion. While it appears we have a global, coordinated plan of attack by Central banks, one might also notice we have a global coordinated plan to counter an economic slowdown. In other words, by all acting in concert, this gives more confirmation that we have a global economic mini-implosion going on. We already know a U.S. recession is projected for 2013. The IMF not only scolded the United States but also is warning on a global economic growth downgrade, coming to a press release near you on July 16th.